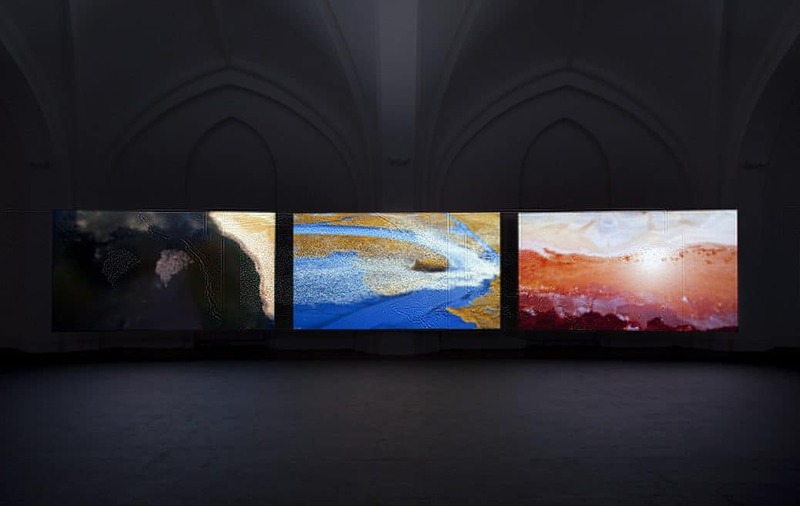 Vertigo Sea, a solo exhibition of two films showing through 10th April, 2016 at Bristol’s Arnolfini, its UK premiere. Where better to see such films exploring the connections between oceans and Empire, slavery and migration and the killing of our natural world than this city built with slavery’s profits? We saw Vertigo Sea first, sat confronting the sea and movement and death and forced migrations on film across three screens. The sounding of waves. The vastness of ocean. The smallness of our own stature in the face of it. The wonder of the creatures who live within it. I imagine the feeling of always being held, wonder if that sounding of waves is something that lives within you if you live within the ocean, if your heart beats to it. Birds, thousands and millions of birds swirl across its surface, like algae, like the shoals of fish that dive and spin. Water is here too in the form of snow, vast expanses, glaciers, landscapes we all know are fast disappearing. Always the vastness of the world, the ocean, the water. Moisture as great banks of cloud upon the earth. Then the vastness of death we ourselves leave behind. 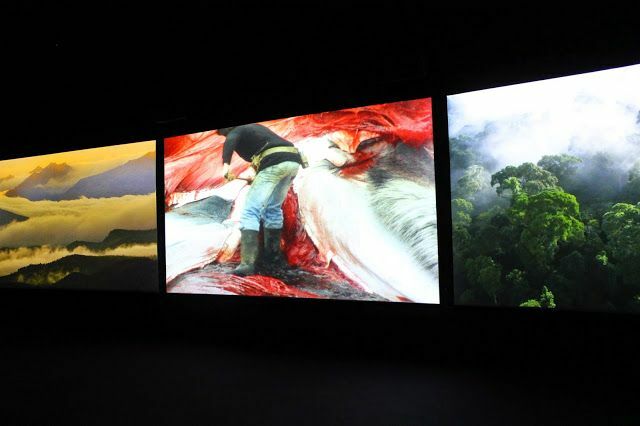 The killing of wild things, the carving up of whales, the rivers of blood. There are those who travel oceans to kill alongside the desperation of others traveling the oceans prised lose from land by war and famine and searching for life and hope. The desperation of others traveling the oceans ripped from all they know, plundered for work and death in lands far away. The oceans connect us in so many ways. Look how we have moved across them, look how we have died in them, look how we have hunted and killed in them. This is a unique meditation on human violence in the face of great, impersonal force. The inspiration for the work came from a radio interview with a group of young Nigerian migrants who had survived an illegal crossing of the Mediterranean. They expressed the feeling of being faced by something vaster and more awesome than they had thought possible. While the sea is mesmerising, universally compelling and beautiful, it is also a uniquely inhospitable environment. It is difficult for us, as humans used to having control over our surroundings, to grasp the enormity of this constantly changing element, and the word ‘vertigo’ perhaps refers to this unfathomable reach. Maybe it’s because I grew up in the middle of the desert, but I love the feeling of being small, love the feeling of being just a tiny part of the world, in the world rather than in control of the world. We are never in control of the world. But I imagine this installation feels different to me than to others, I wonder if it does provoke a sense of control being absent. An overwhelming. I hope so. But how I mourned through this film, mourned the death and all of those lost. Now and then, too, I turned my eyes from the killing. We couldn’t see both installations the same day, seemed to us Vertigo Sea was too powerful. So we went back to watch Tropikos two weekends later. Situated in Plymouth and the Tamar Valley – locations with significant, though largely forgotten connections with the expansion of European power and influence – Tropikos is an experimental drama set in the 16th century. 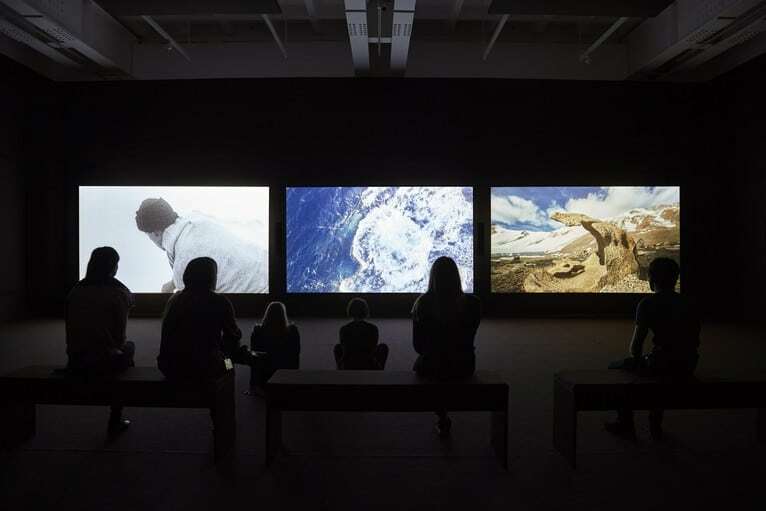 Akomfrah’s starting point for the film was the connection between the waterways of the South West and the slave trade. 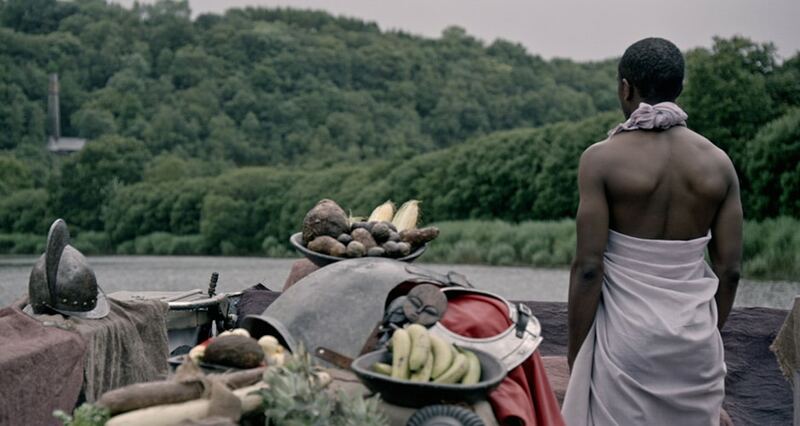 In this film, the river landscape is transformed into an historic English port to re-imagine some of the first British encounters with people from Africa. Again, the pounding of oceans. Elizabethan costumes vs white draped simplicity, the deep roar of passage and rending, black skin in water and warmth but there is the looming English presence behind and you long to call out, to warn. Too late. Black faces are seen in frigid English landscapes, floating still and silent down the Tamar, landscape passing in emerald fields and grey skies behind these people stolen and surrounded by goods stolen with them. Bowls overflow with pearls and precious things, corn, roots and tubers. Dressed first in simplicity, but later boxed into new finery. Always there is the sounding of oceans. Only one table shows what England gave in return: wildflowers, a bible, a sword. Death is here too, it is hanging. Birds and fish with glassy eyes and bodies cut to let them bleed. Other trees hung with pineapples and daikon radishes. Always the cold arrogant English faces in contrast, husband and wife unable to speak to touch to share the same spaces. Sidelong glances at the others come among them. Words from Hakluyt, Shakespeare, Milton, Gaston Bachelard….they mingle with Melville from Vertigo Sea. Both are powerful, both had moments so reminiscent of his other work, particularly Last Angel of History, but perhaps it is because I saw that not too long ago. But there are these stills, posed, surreal elements of physical things with a huge weight of symbolic meaning. 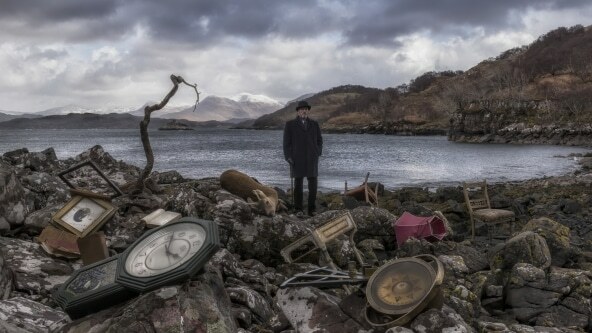 The detritus of our lives washed up on the stones, yielded by the water. The ending of time. Go see them if you can.